Some people like Alyx Kopie’s pro-life artwork, but others are offended by her thought-provoking and controversial depictions of unborn babies. The SS. Francis and Clare of Assisi parishioner and Center Grove High School junior understands their feelings and appreciates their honest comments. She started creating pro-life artwork last year in her art classes. Alyx said she will be very happy if her artwork convinces even one woman who is experiencing a crisis pregnancy to choose life for her unborn child. She also hopes her pro-life creations will challenge pro-choice supporters to think carefully about the morality of the tragic and senseless deaths of more than 54 million babies in legalized abortion since the U.S. Supreme Court passed Roe v. Wade on Jan. 20, 1973. Servants of the Gospel of Life Sister Diane Carollo, director of the archdiocesan Office for Pro-Life Ministry, decided to display Alyx’s multimedia artwork at the Archbishop O’Meara Catholic Center, 1400 N. Meridian St., in Indianapolis for several weeks. Alyx’s mobile and three pictures in various media will remain at the Catholic Center until Nov. 17 then will be displayed at SS. Francis and Clare Church, 5901 Olive Branch Road, in Greenwood from Nov. 22 until mid-December. Titled “Collateral Damage,” her baby mobile illustrates how unborn life is fragile and literally hangs in the balance in our culture due to legalized abortion. It is made of silver coat hangers with strings that are attached to small, clear plastic balls. 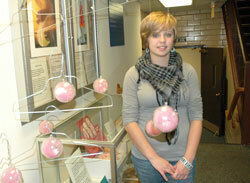 Inside each ball is a little fetus sculpted from clay resting in light pink tulle to symbolize the womb. “First Steps,” a pastel chalk picture, focuses on the unborn baby’s feet inside the womb. Another picture, “Roe v. Wade,” is Alyx’s first pro-life drawing and is done with colored pencils. It shows several fetuses floating inside a lava lamp, which was popular in homes during the 1970s when abortion was legalized. Her acrylic painting on display is titled “I Wish You Were a Seahorse,” and shows a male seahorse with one of his babies. Alyx is a member of her parish youth group as well as the Archdiocesan Youth for Life organization. She also participated in the March for Life in Washington, D.C., last January. 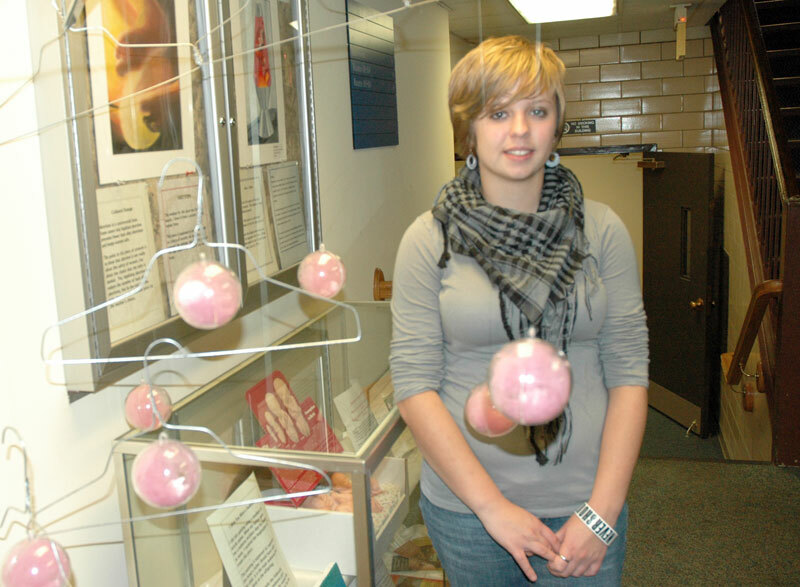 Alyx’s interest in educating people about the sanctity and dignity of life from the moment of conception began when she saw a video about prenatal development during a ninth-grade biology class field trip to a museum. Alyx said that Gina Hines, the youth ministry coordinator at SS. Francis and Clare of Assisi Parish, discussed abortion facts and Church teachings on the sanctity of life with her and then encouraged her to become a pro-life volunteer. She also prayed during a “40 Days for Life” prayer vigil last spring in front of the Planned Parenthood abortion facility in Indianapolis. At her school, Alyx participated in an annual abortion awareness day by wearing a piece of duct tape printed with the word “Life” over her mouth.